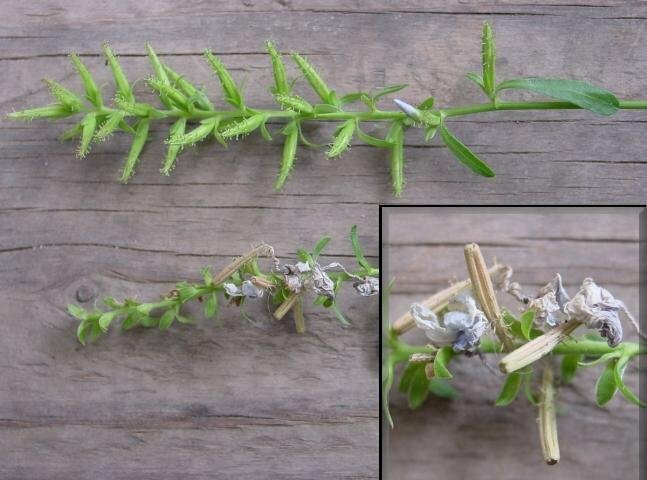 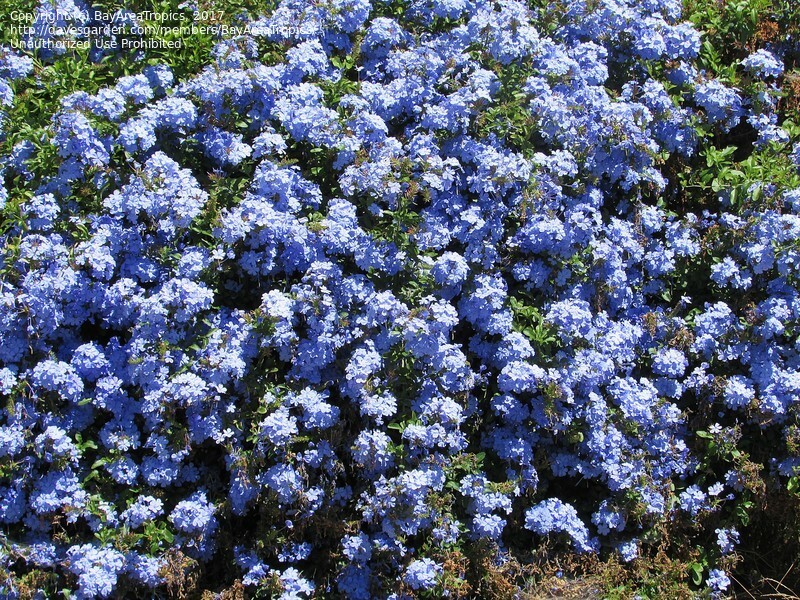 The flowers of this plant are a lovely azure blue. 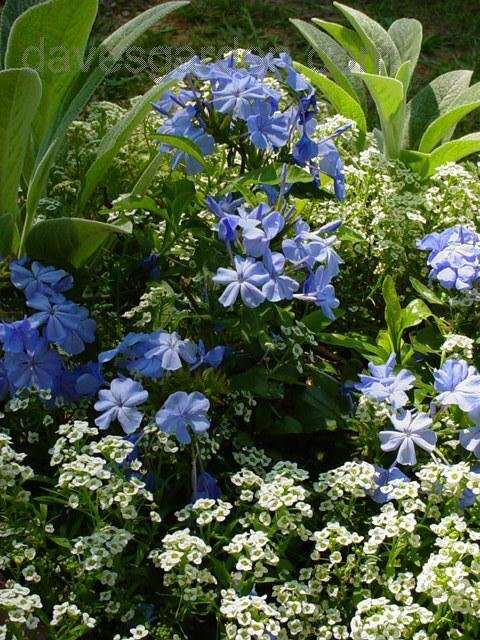 They brighten any corner of the garden. 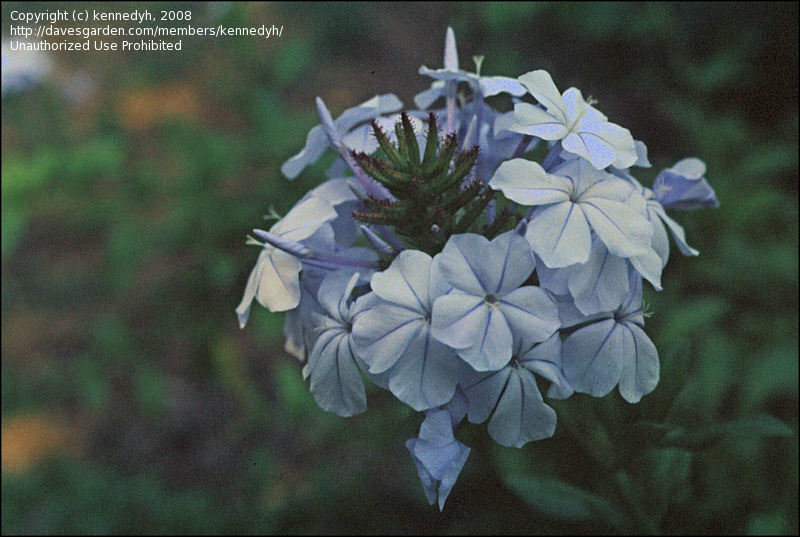 June 15, 2003 (Kerrville, Texas). 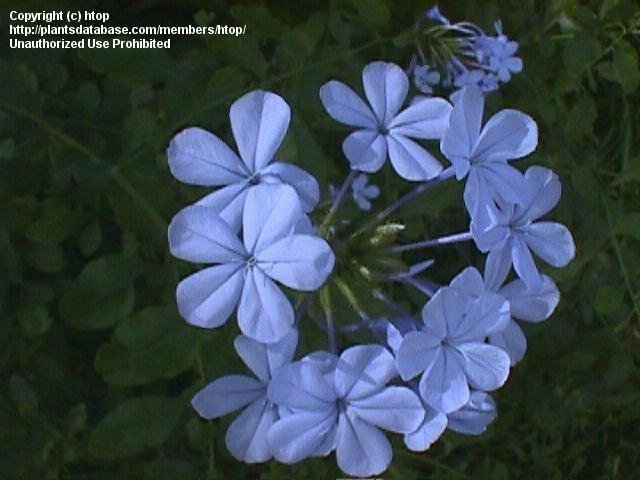 I live near Detroit MI, in Ontario. 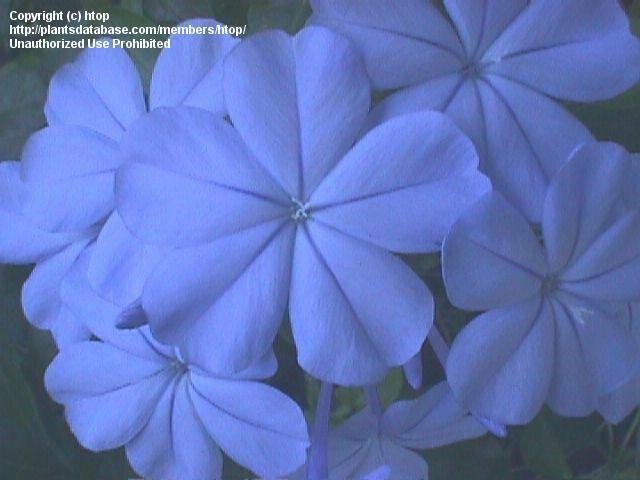 I'm in zone 5. 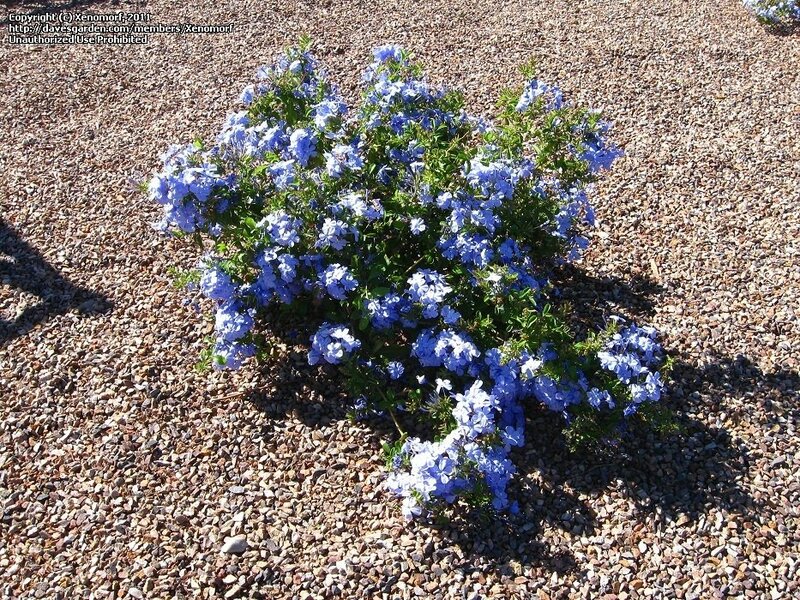 This is the second year my Plumbago has bloomed. 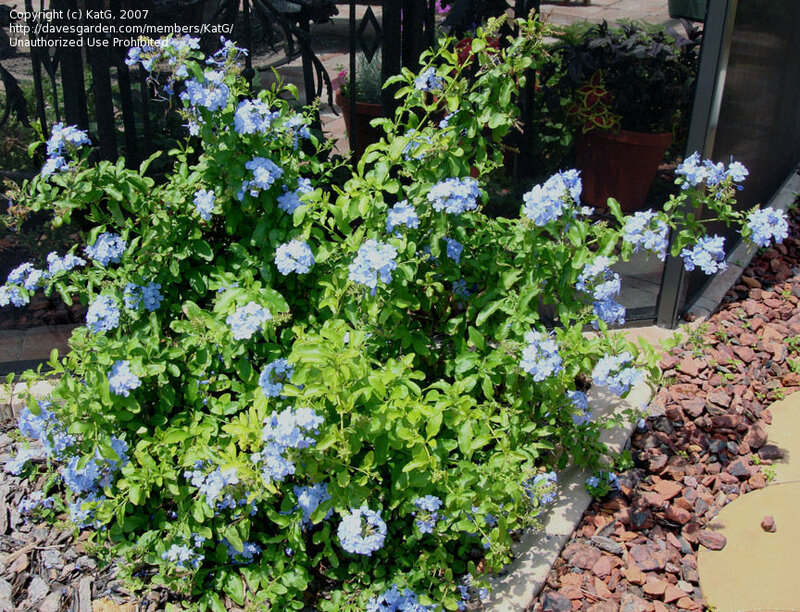 I bring it in in October, and last year kept it under grow lights, where it bloomed again in winter. 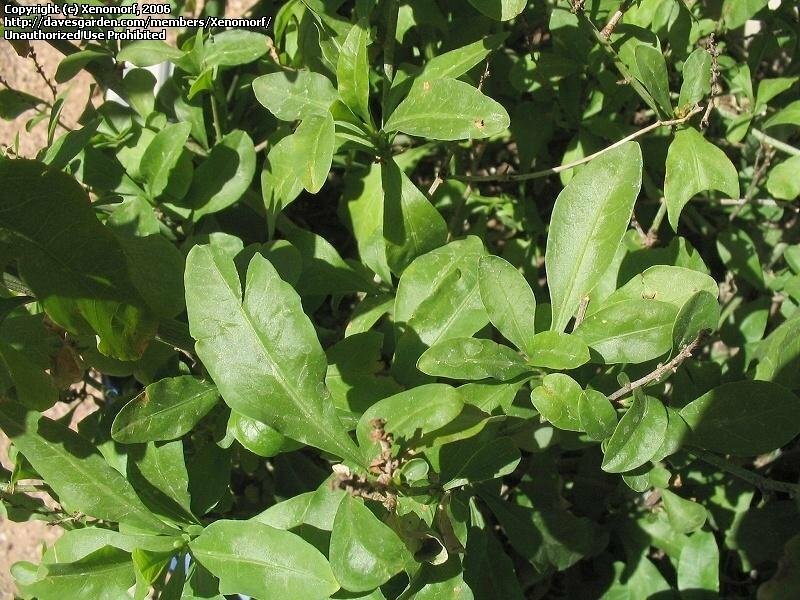 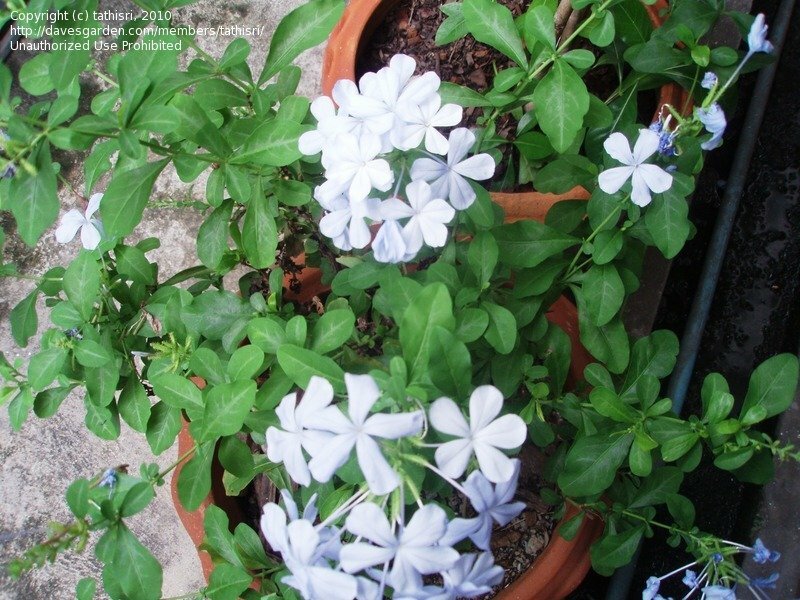 It is very easy to grow in a pot, in full sun. 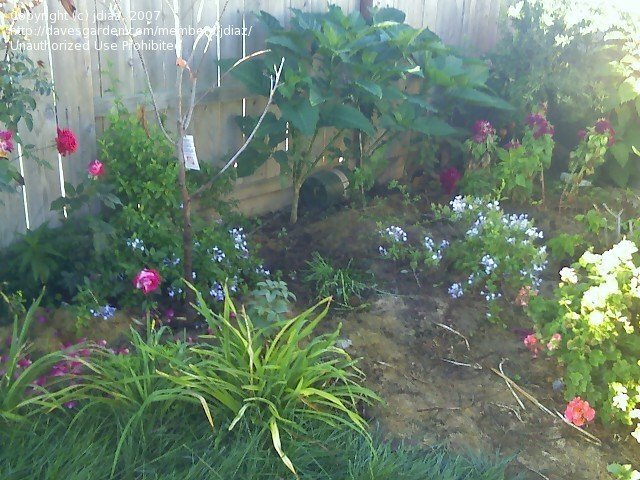 Water to keep it from drying out. 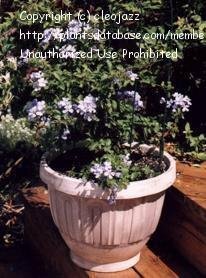 It seeded itself and I harvested a new plant in the pot, but am not sure how. 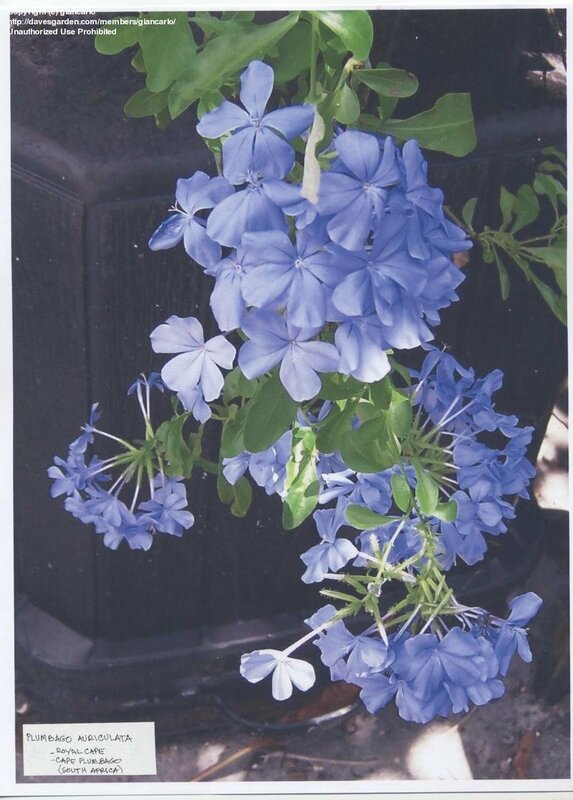 I have this one growing in a large container. 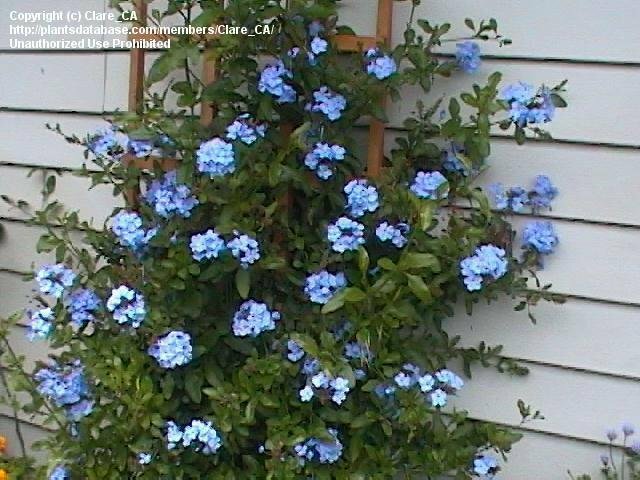 I love the blue in the flowers. 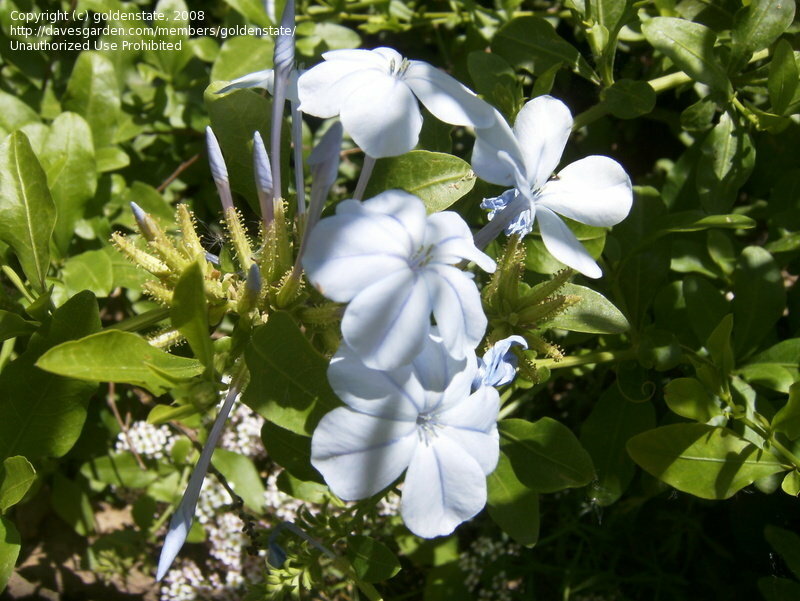 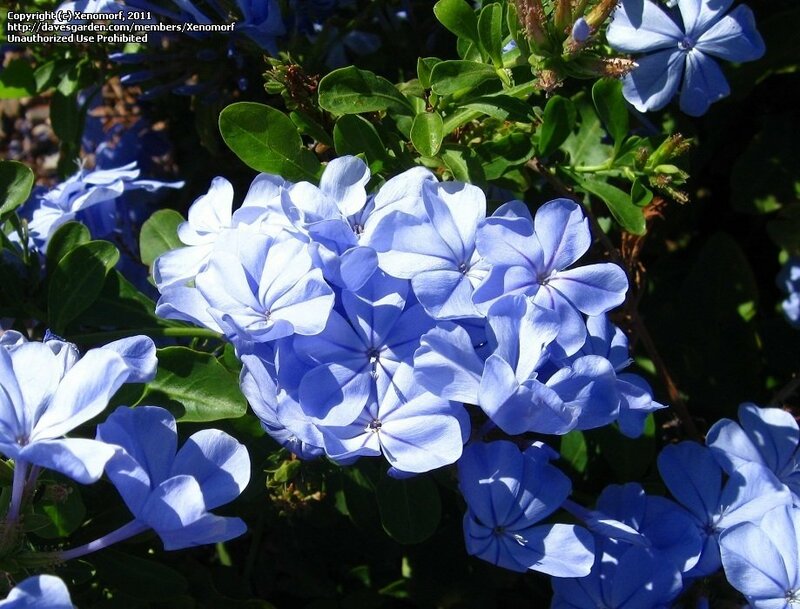 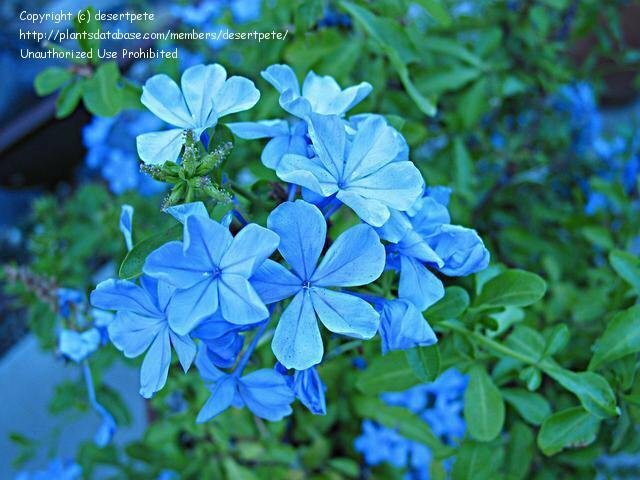 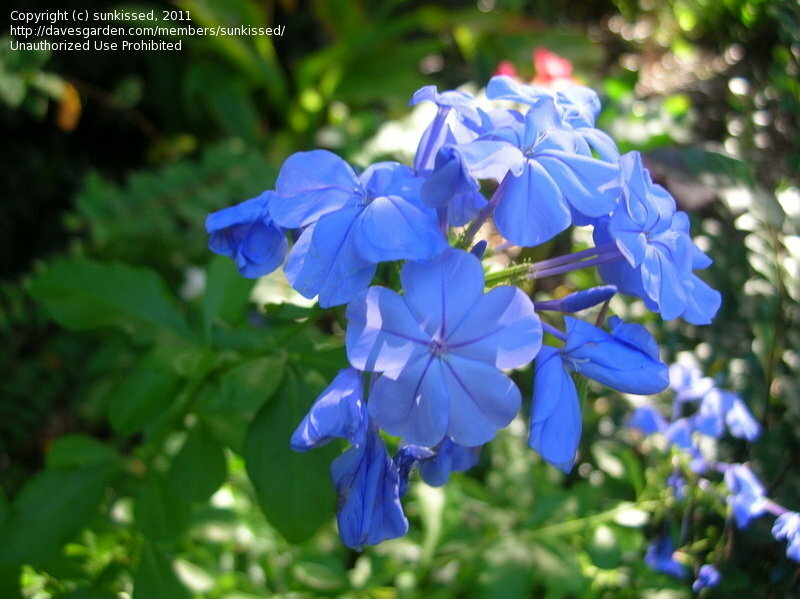 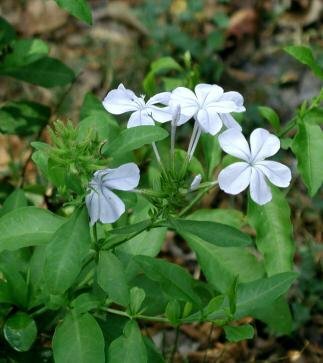 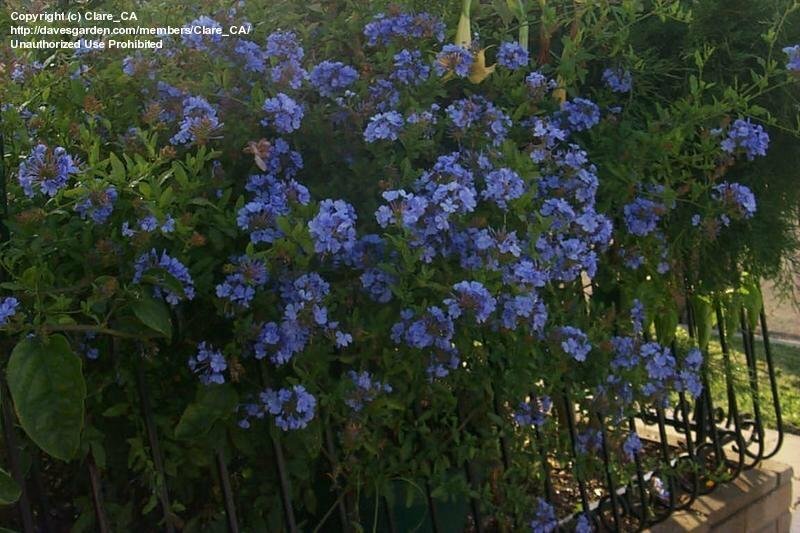 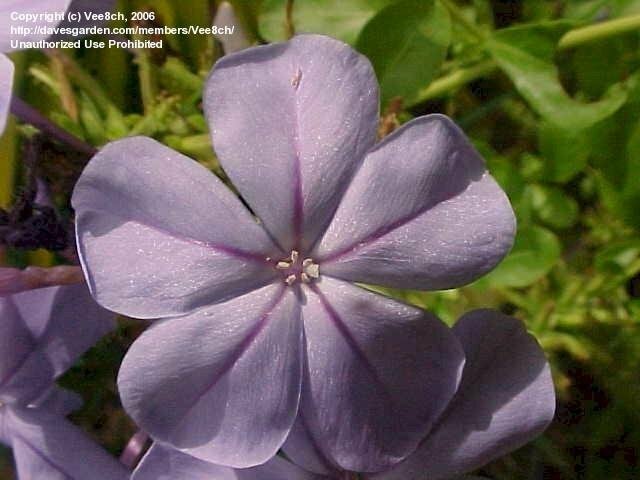 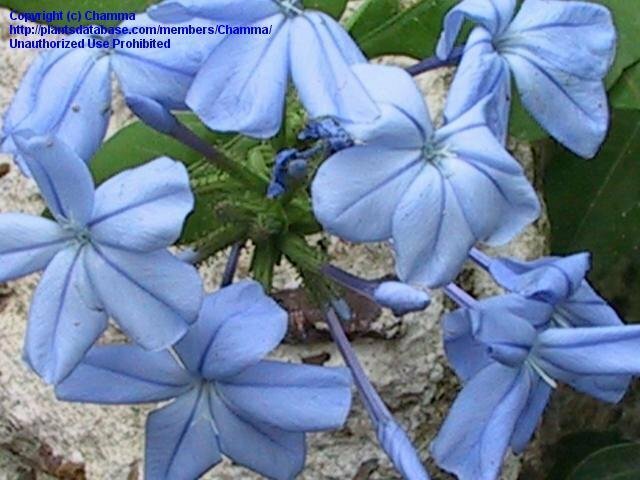 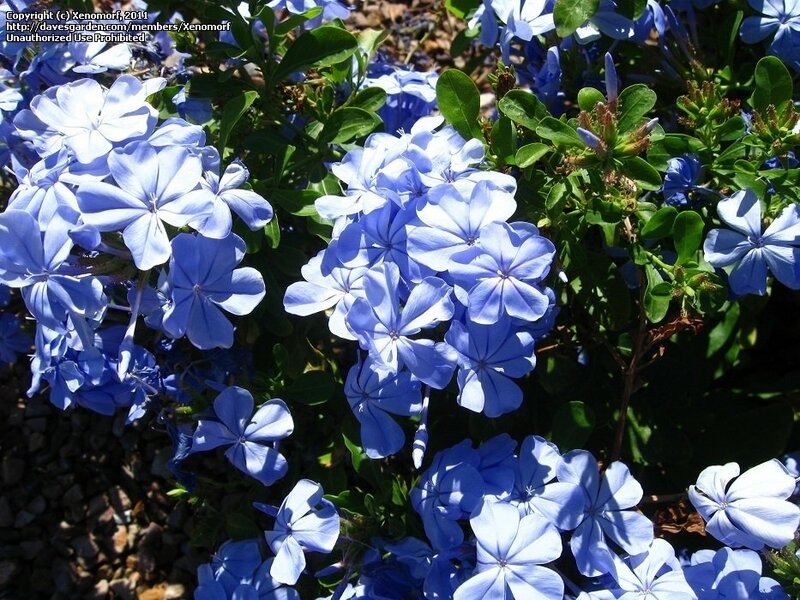 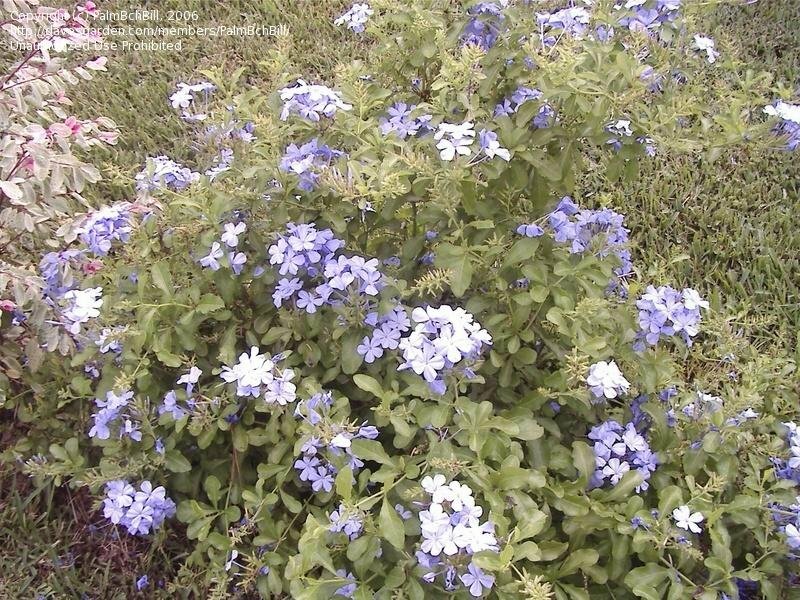 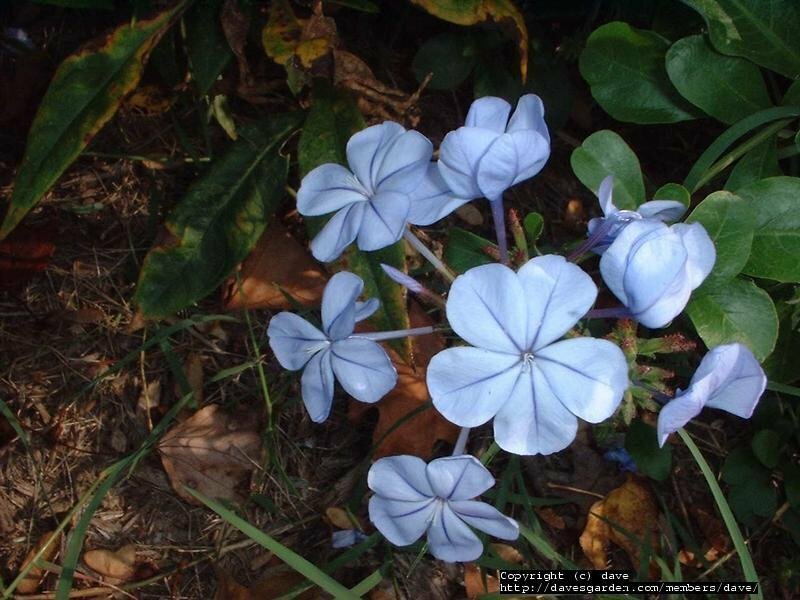 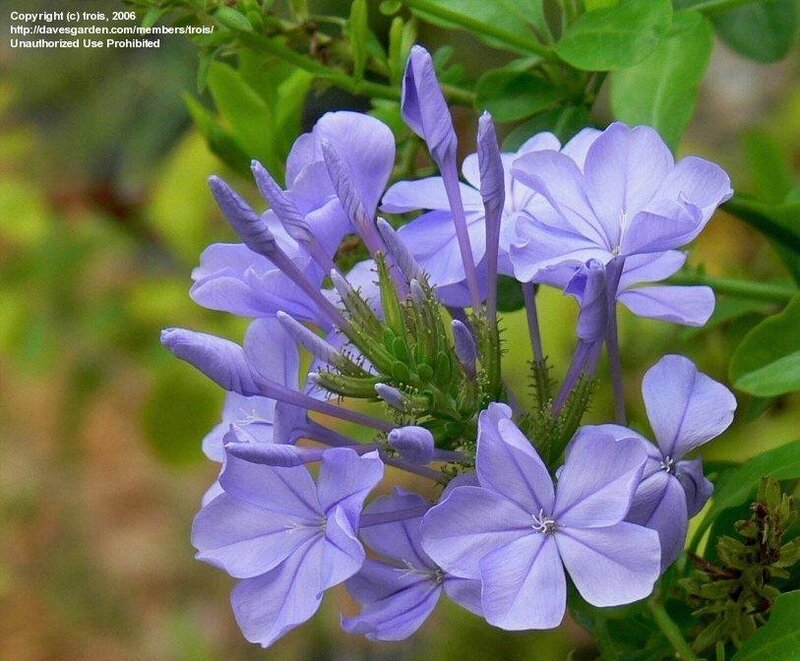 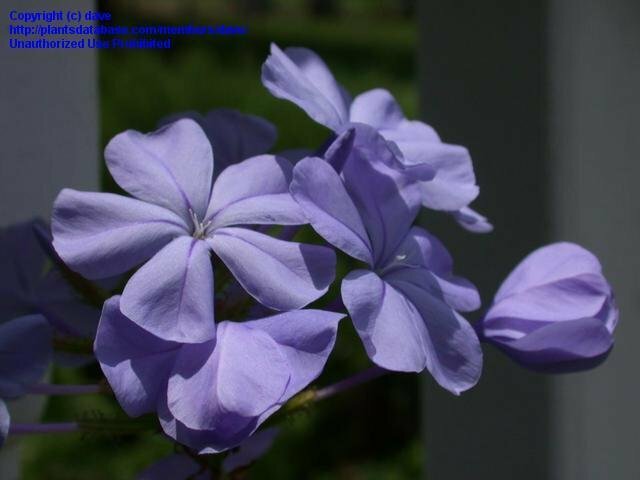 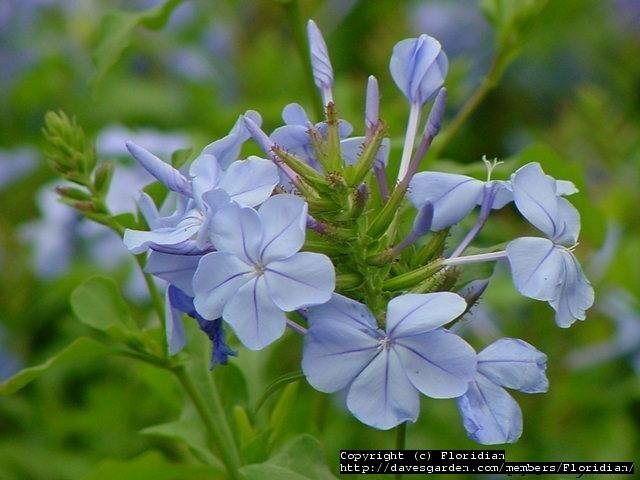 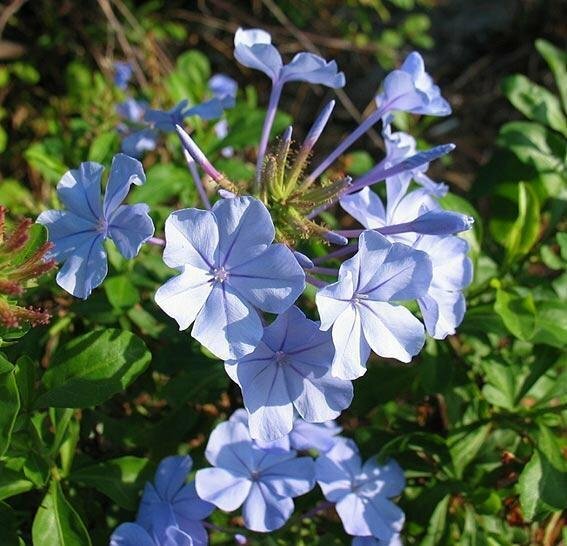 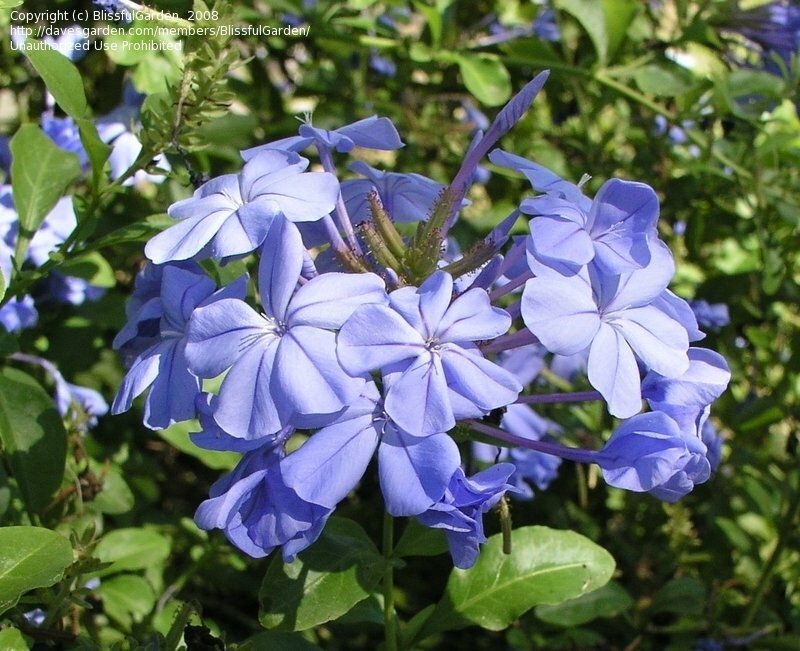 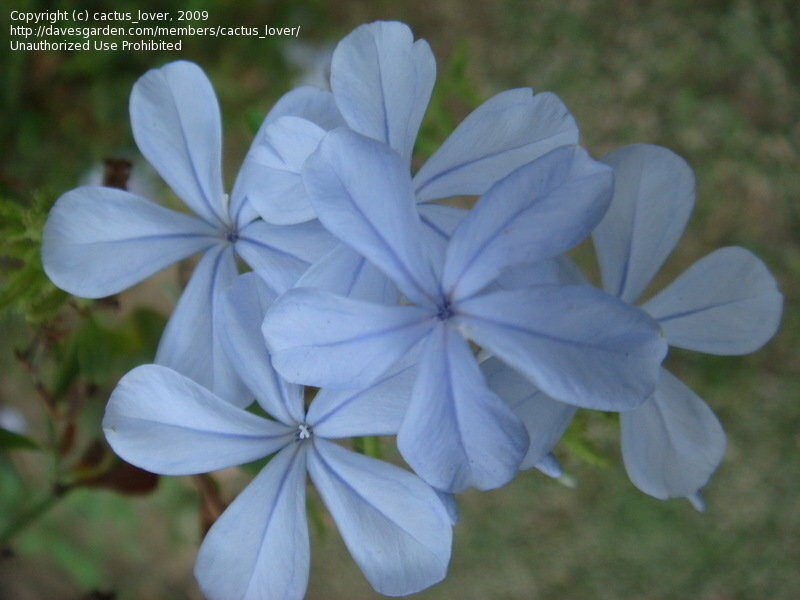 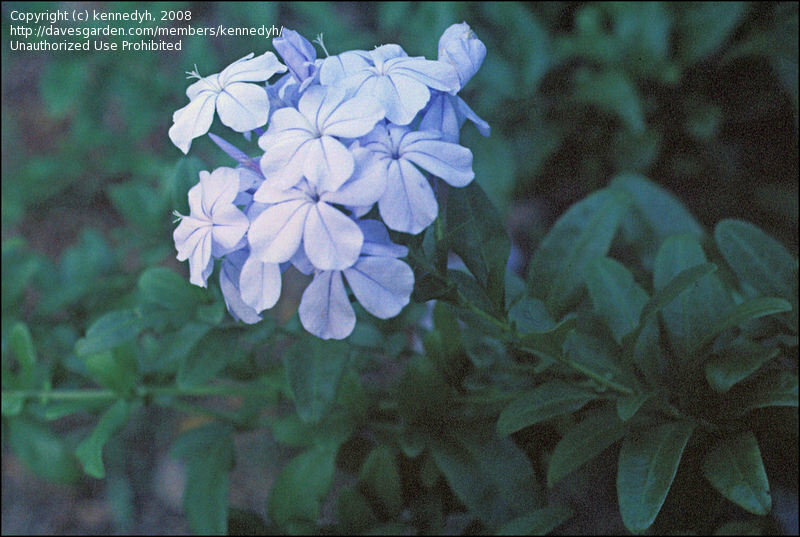 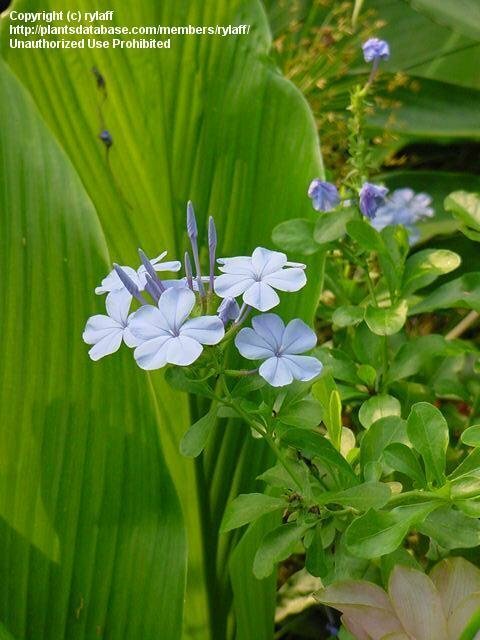 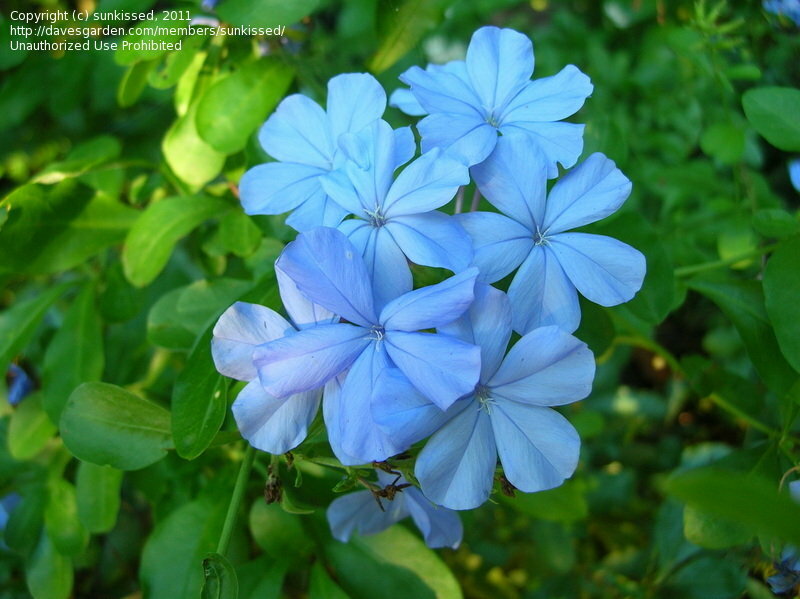 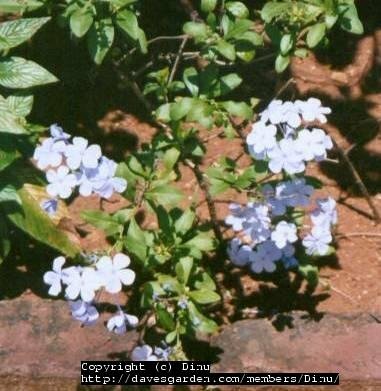 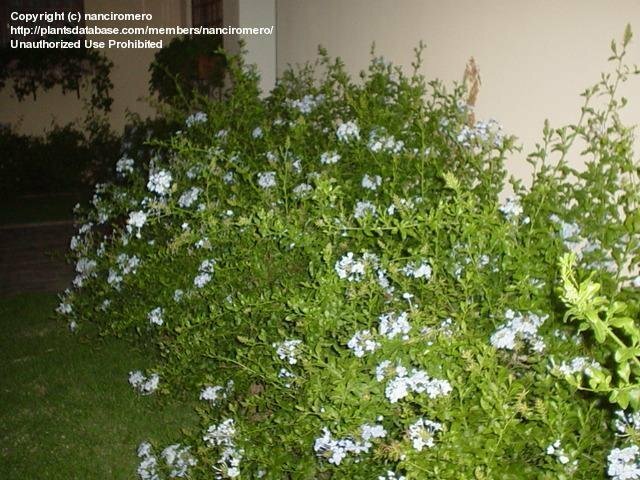 Plumbago capensis - Nanci Romero, Brasil. 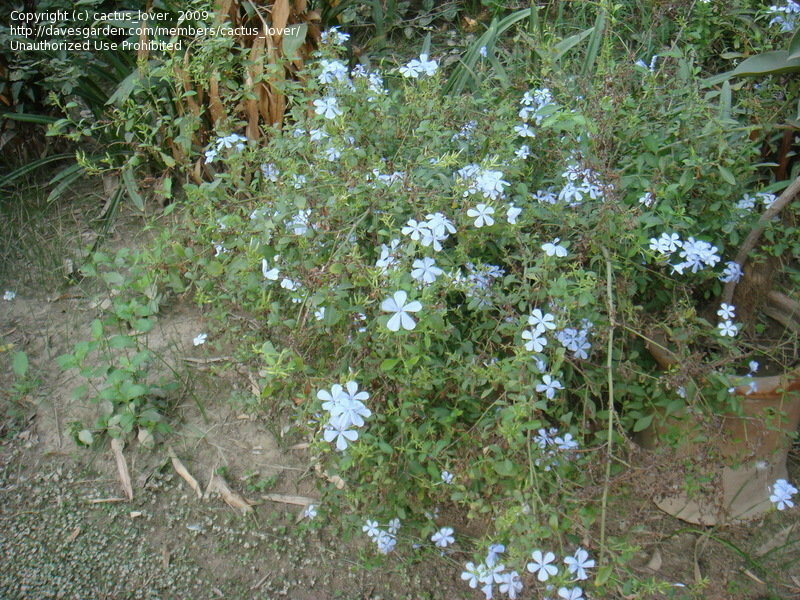 This plant is doing very well growing in large container. 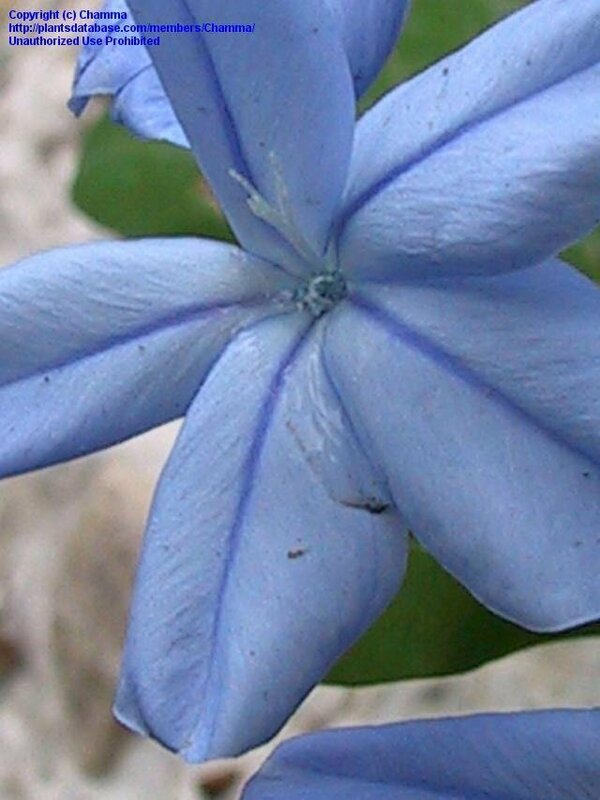 One of the few bright blue flowers in this area. 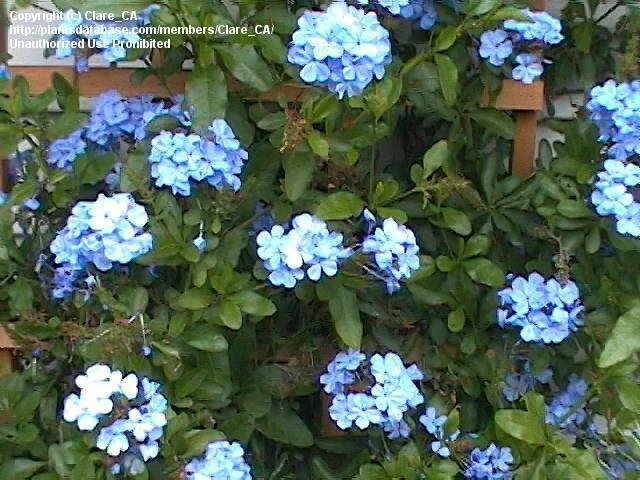 Not invasive here. 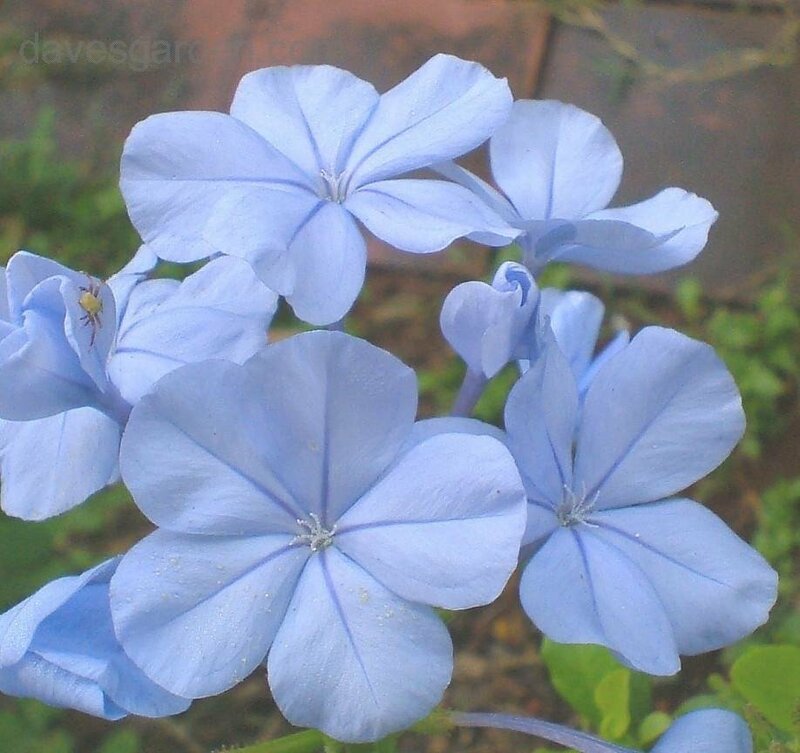 Long bloom season. 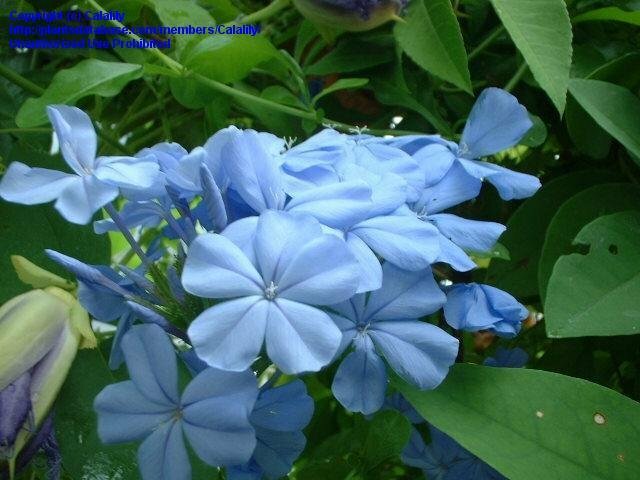 The colour is Azure blue. 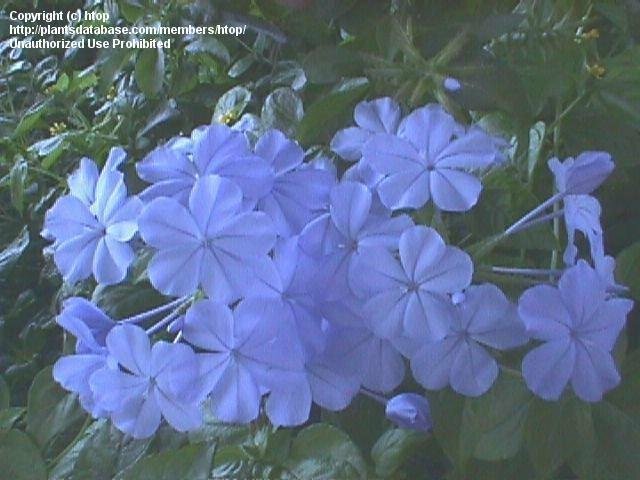 Growing in zone 9a in light shade. 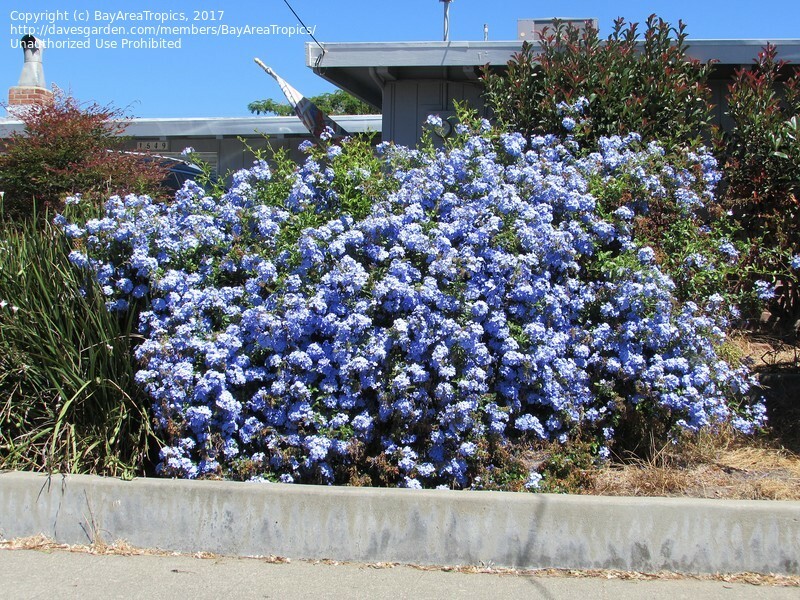 mid April, late Spring. 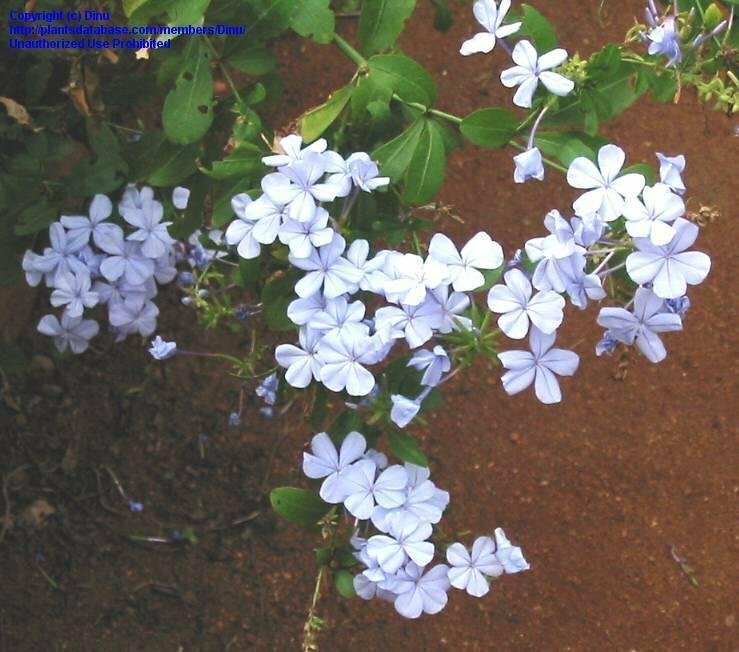 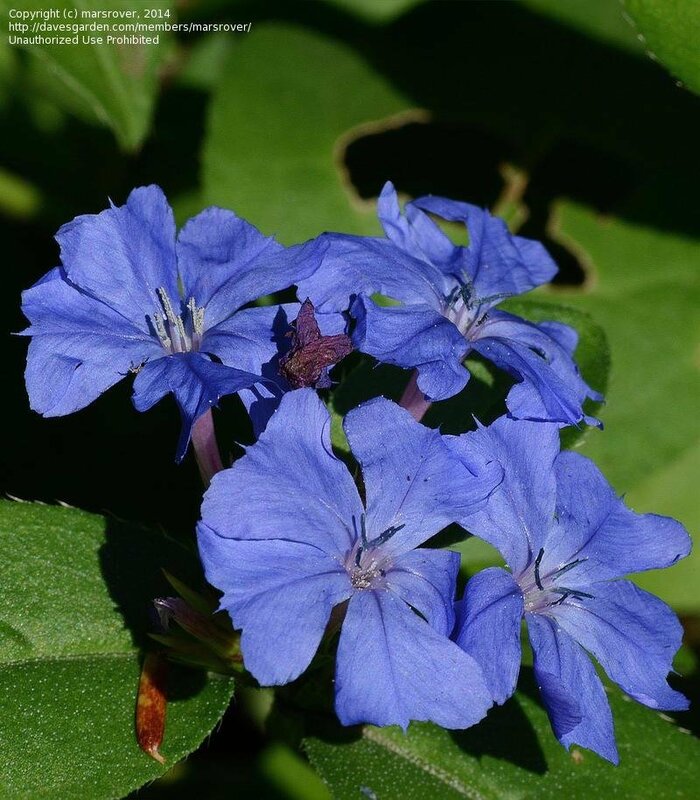 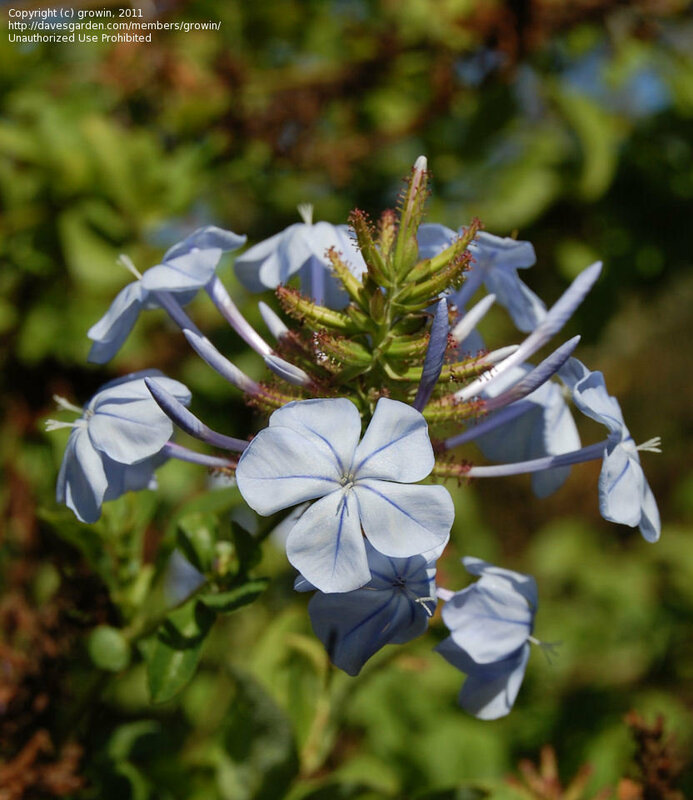 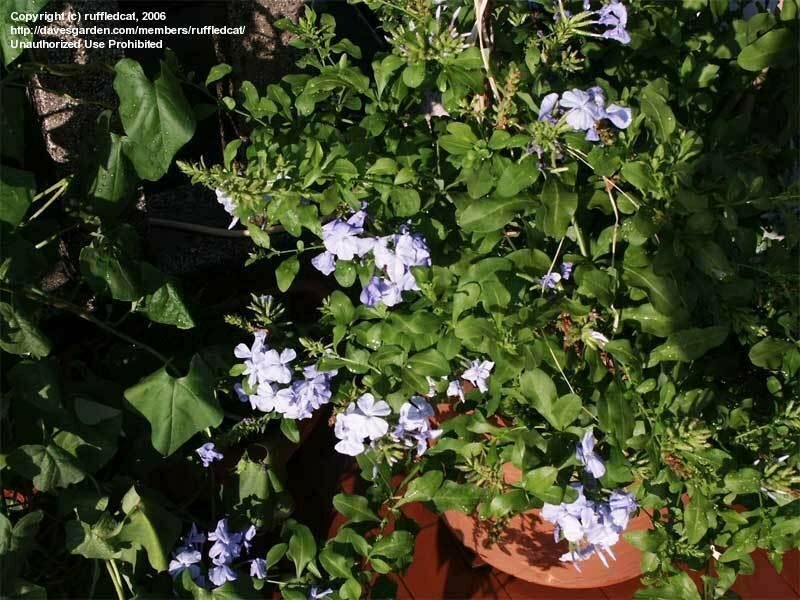 Plumbago, Cape Leadwort (Plumbago auriculata) is a nectar source for many types of butterflies and a larval host for several. 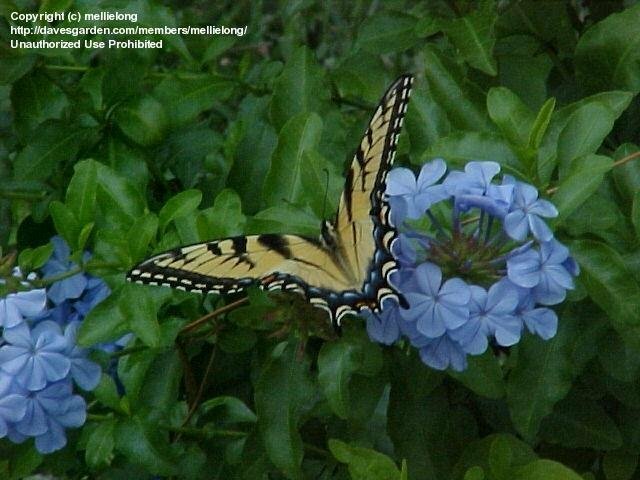 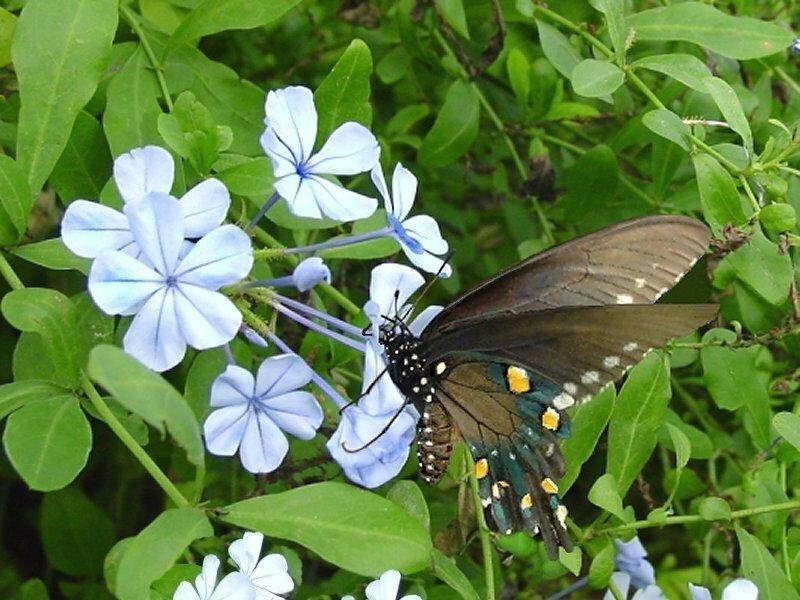 A pipevine swallowtail ((Battus philenor) is nectaring on a flower. 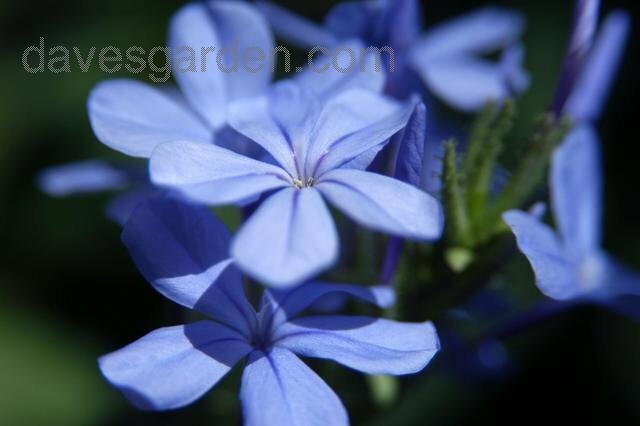 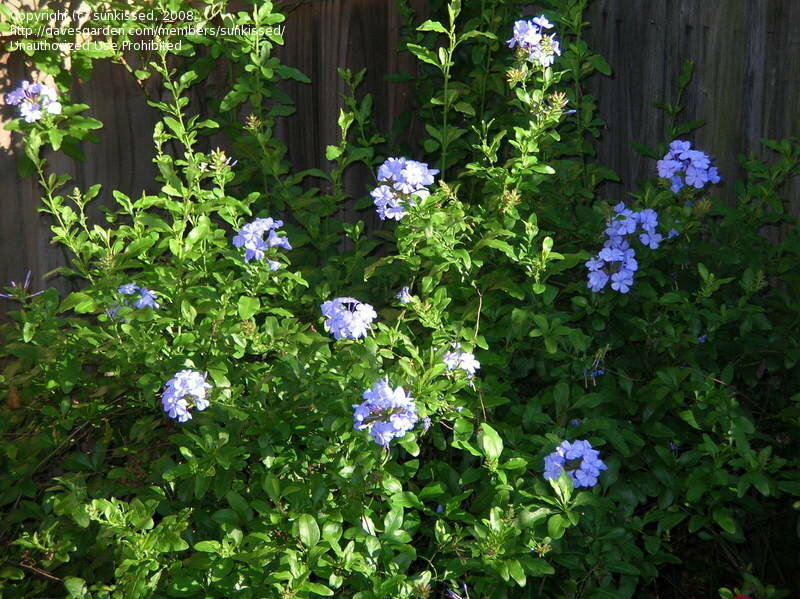 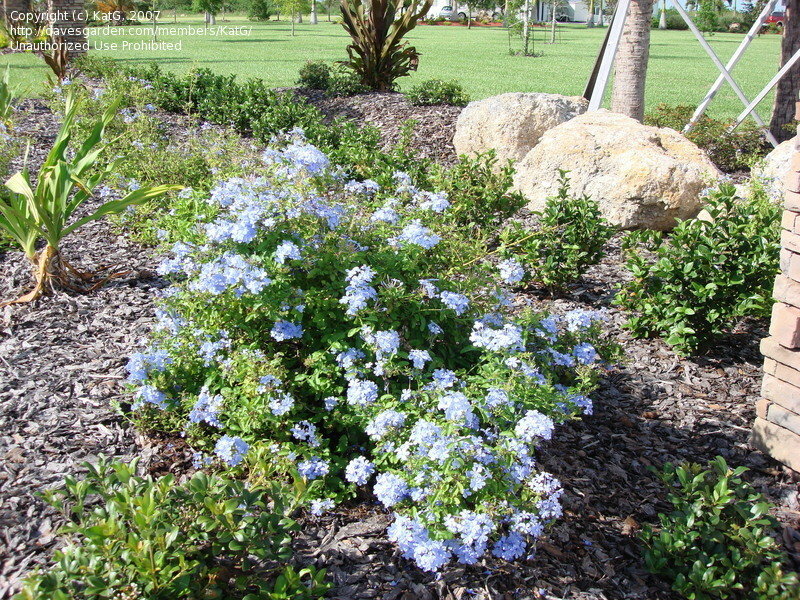 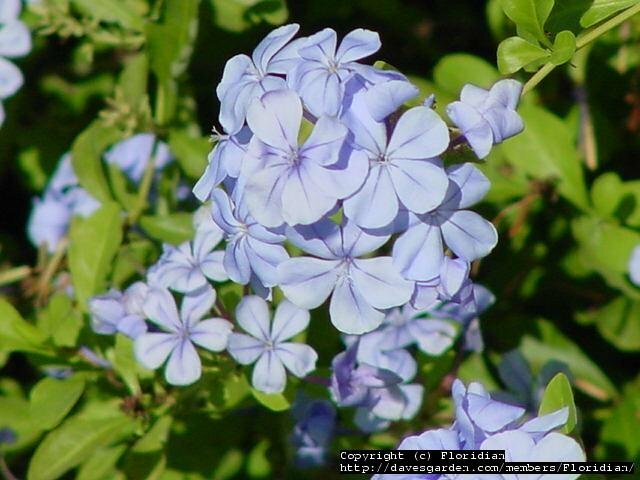 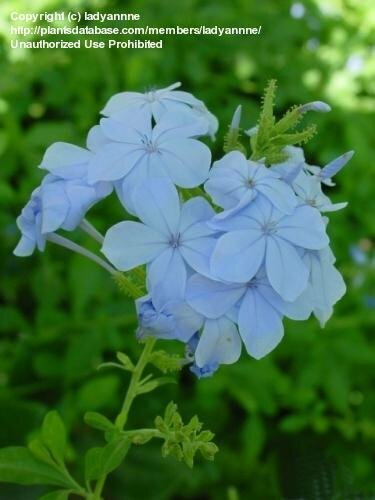 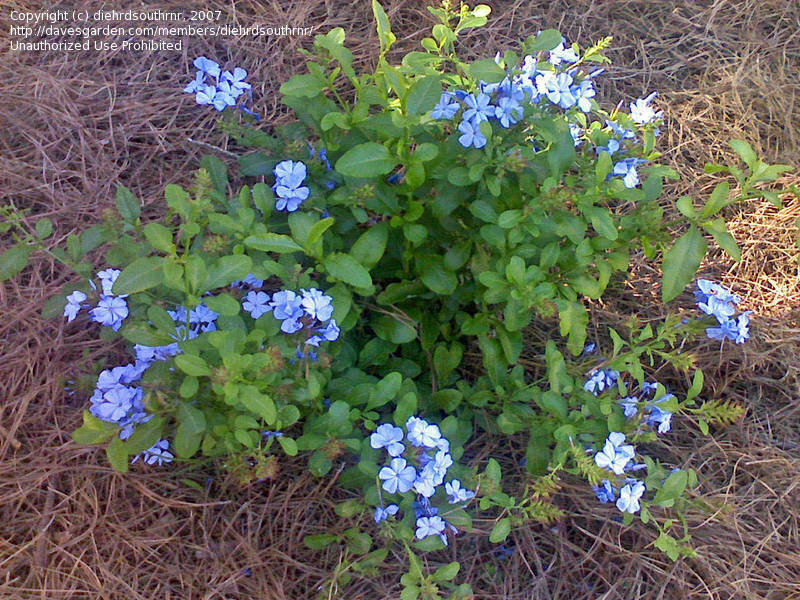 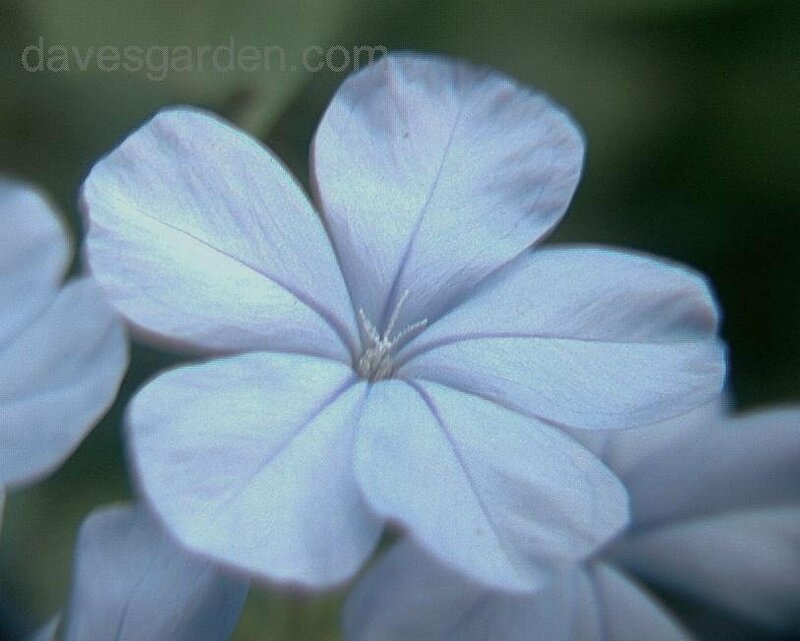 I Love Plumbago...it seems the less attention you give it, the better it grows! 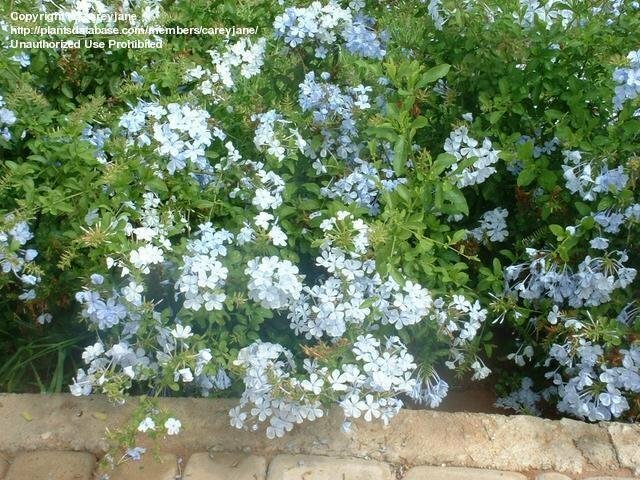 The plumbago has been absolutely amazing this year...so low maintenance too! 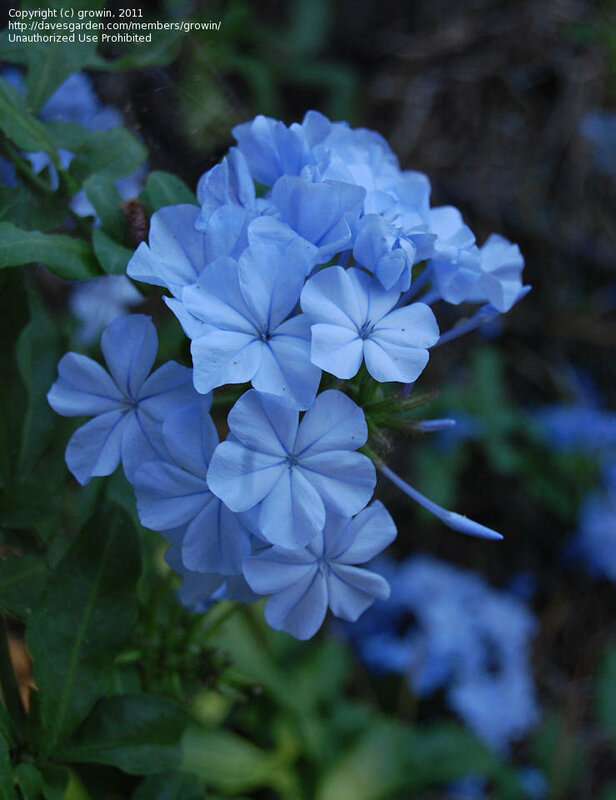 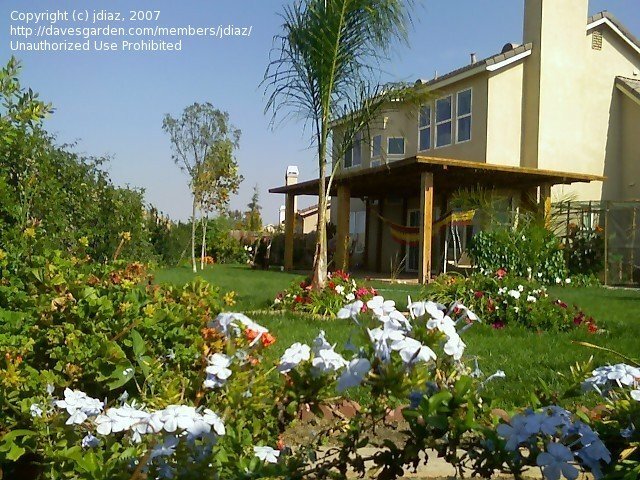 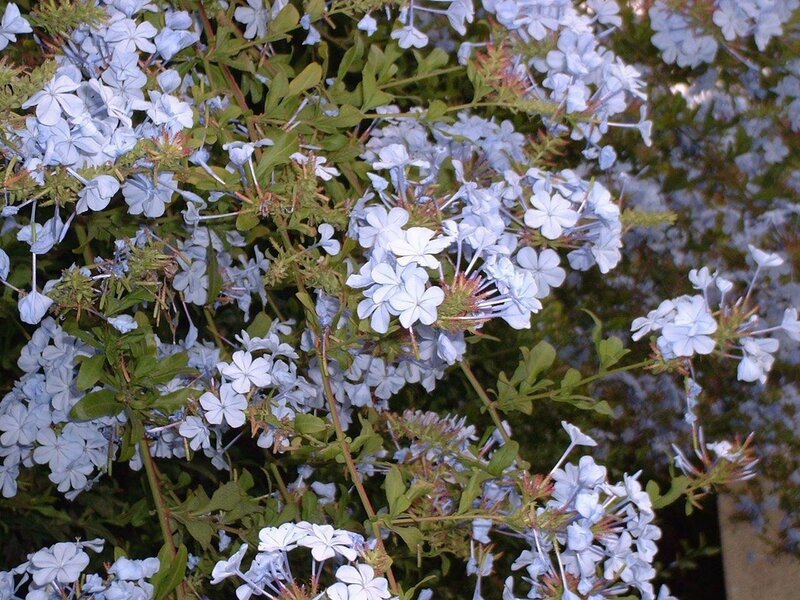 Almost always in bloom, plumbago is a welcome and hardy perennial in our courtyard. 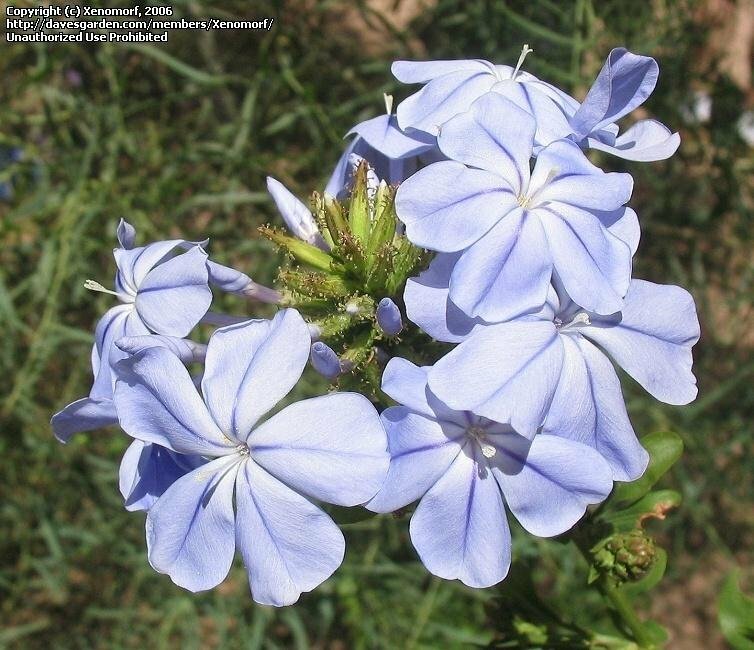 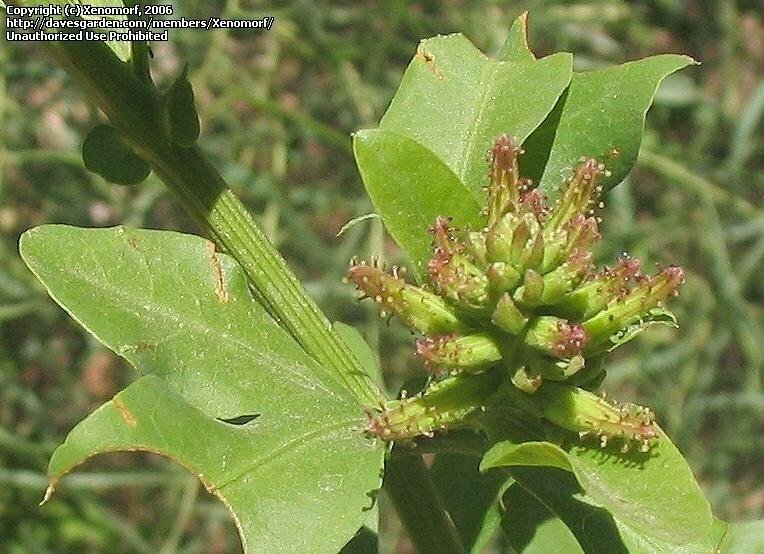 Growing in Safford, Arizona, Graham County, Oct 15, 2011, Autumn, zone 8b, elevation 2900 ft.
A close look at a few flowers on 26 August 2014.